Helsinki-Vantaa Airport is the main international airport serving Finland and has two terminals, linked by an internal pedestrian connection. Thanks to Finnair, it is one of the busiest airports in Europe and a hub for Baltic and intercontinental planes. Situated only 5 kilometers from Tikkurila and about 15 kilometers from Helsinki, Helsinki-Vantaa Airport is easy to reach by bus. Even if it is relatively small for an international airport, it is a pleasant and modern space, with lots to offer. Helsinki-Vantaa Airport features lots of shopping and a handful of great restaurants. Even better, they now have a brand new full spa at the airport, where you can experience anything from a Finnish sauna or a variety of massages, all without having to leave the airport. This is practical for people who are in transit without a Schengen visa. 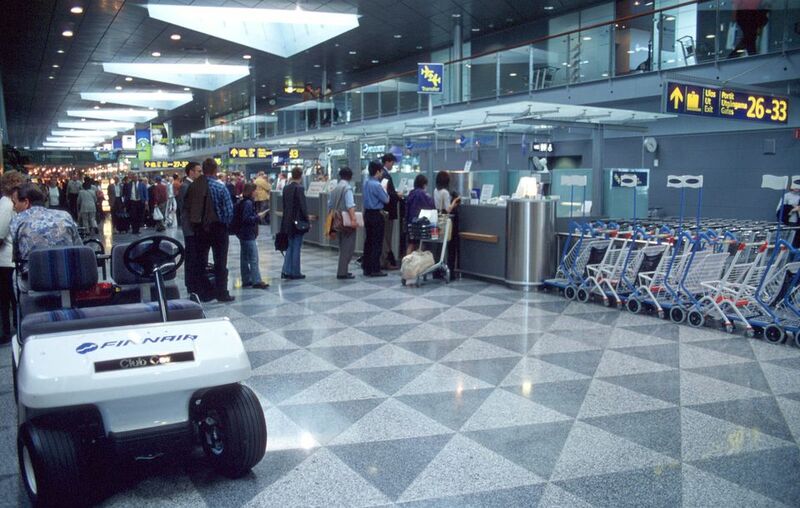 As with most airports, Helsinki-Vantaa Airport can be quite expensive, but it was rated as one of the best airports worldwide by the Association of European Airlines in 2005. Flights were also rated to be the most punctual here. Whether you are in transit and wish to explore the neighboring city of Helsinki (assuming you have a Schengen visa) or you're traveling to Helsinki-Vantaa Airport, there are a few options available to you. The construction of the Kehårata train link going straight to the Helsinki city center began in 2009, and is planned to go into operation in 2014. Some tourists prefer the freedom that comes with car rentals in Helsinki. Helsinki-Vantaa Airport is conveniently placed for exploring the southern regions of Finland. Helsinki is only a few minutes away, and can be reached by either taking the E18 (Lahdenväylä) and the A45 (Tuusulanite). A variety of car rentals can be found at the airport, or booked in advance online. If you decide to make use of a taxi service to Helsinki, it is best to do your research in advance. A private taxi service can cost around 45 Euros. Helsinki-Vantaa Airport does offer a taxi service which should have a fixed rate, at around 25 Euros for 2 people. The most economical way to travel by far is making use of the airport shuttle bus services to and from the airport. Helsinki-Vantaa Airport offers a shuttle bus straight to Helsinki city center. The shuttle is an air-conditioned express bus, which makes it quicker and more comfortable, but it is also about 50% more expensive than the public buses. There are two regular bus connections running between the airport and the main railway stations in Helsinki. Bus number 615 leaves every 15 minutes from platform 21. Tickets are around 3.80 euros and can be purchased from the driver. The average journey takes about 35 minutes, and stops at the National Theatre, just behind the central station. Going towards the city, the bus will stop a few times by request. Simply press the stop button. The Central Railway Station in conveniently located in the center of Helsinki, with a lot of attractions within walking distance. The Olympic Stadium is only 2 kilometers away, and the Museum of Contemporary Art is right outside. The station provides access to commuter trains as well as long distance trains going to Lahti and all the way to Moscow. Coach connections to all parts of Finland are provided by Matkahuolto and Express Bus. Going back to the airport, the Finnair shuttle leaves from platform 30 at the station. The airport buses are either blue or white, and run between 5.00 am and midnight. Bus 16 departs from Rautatientori on the right hand side of the station from platform 5. If you can see a Finnair bus, look for the regular buses at the stops next to it. All buses will take you the departure point at terminal 2 at Helsinki-Vantaa Airport. Isn't Finland the Safest Country in the World?